Lars Iyer's latest novel explores sadness and genius while contemplating the end of philosophy. In 1966, John Lennon wrote "Tomorrow Never Knows", a song with little outward progression, played primarily in the key of C. Deceptive in its simplicity, and a testament to the genius of The Beatles, the song reveals its depths and slight-of-hand-style progression as you study and examine it. The same might be said for Wittgenstein Jr., the new novel by Lars Iyer. As you read it, the book seems to follow the pattern of a song written in one key, a song without a bridge and little-to-no outward progression. But as you dig deeper, as you contemplate and explore the novel, you’ll unravel the texture and complexity of its seemingly simple structure. On its surface a campus novel about a group of students at Cambridge who fall in with a professor of philosophy, Wittgenstein Jr. is more a portrait of a tortured genius than a bildungsroman, which, ostensibly, is the shape it assumes at first glance. The professor is an eccentric genius to whom the students refer as Wittgenstein Jr, after Austrian philosopher Ludwig Wittgenstein. Like the real Wittgenstein, Iyer’s professor is in search of an anti-philosophy, one that will end the need or necessity for philosophy. Also like the real Wittegenstein, the professor doesn’t teach a traditional course -- there’s no syllabus, no class schedule, there are no structured lectures or tests. Instead, each class consists of the genius riffing and thinking out loud while he tries to discover his much-sought-after anti-philosophy. Told from the point of view of a student named Peters, the novel, in a sense, takes a lead from The Great Gatsby, in which the narrator is often a passive observer instead of an active player. This narrative choice works well for the first two-thirds of the book; however, Peters switches from passive to active in the final act, and the transition feels clunky. Although perhaps the most important philosopher of the past century, Wittgenstein published only one book in his lifetime, Tractatus Logico-Philosophicus. His later work, Philosophical Investigations, was compiled from notes and partial manuscripts and published posthumously. Other manuscripts were found and subsequently published; so, too, were lecture notes taken by students and compiled thematically. In his prose, which is minimalistic, Iyers often mirrors lecture notes, in a possible ode to some works published under Wittgenstein’s name. Wittgenstein, on his chair at the front of the room. Who will come with him to wash off his brain? Outside. Wittgenstein, walking ahead of us. Students in surging groups. Students everywhere, a sea of them, moving in fast currents. Vacillating between fragmented sentences and flowing prose, the narrative often feels intimate and immediate, a feat that F. Scott Fitzgerald couldn’t manage in his masterpiece. However, good prose should feel seamless, and great writers can present their style in a way that conceals it. This isn’t always the case with Wittgenstein Jr.
For example, Iyer is a fan of italics. One might even say that he’s obsessed, and this obsession often undermines the subtly and simplicity of the prose. A great writer can pen a novel without italicizing a single word. The force of strong writing renders italics superfluous, or irrelevant. Here, Iyer makes love to ctrl + i, and as a result the book is littered with italics. Flipping open the book, turning to a random page, will yield at least four or five italicized words. In fact, you might be hard pressed to find another work of fiction employing italics so liberally. Iyer, a lecturer in philosophy, also employs philosophical concepts liberally. Unlike the italics, however, the philosophical ruminations work to great effect. If you’re wary of philosophy, if you took a philosophy class in college and hated it, if you’ve never felt or expressed interest in philosophy, don’t worry: this isn’t a didactic work. You will not find the history of philosophical concepts and arguments expressed here. You will not have to wade through sections that feel plucked from a textbook. The philosophical investigations are expressed solely through the context of this book, and many of them feel new and fresh. Many of them are expressions of Wittgenstein Jr’s torment. Depression, sadness, gloom -- these three themes permeate the novel, and the subtle prose conveys them with deftness, immediacy, transmitting them to the reader, who slowly begins to understand Wittgenstein Jr’s obsession with bringing an end to philosophy. Why is Wittgenstein Jr. so obsessed with conceiving an end to philosophy? What haunts him? What drives him? These questions are central to the novel, and they are, at their core, what drives and motivates the character and the narrative. They are the hinges on which the structure turns. And they are both an asset and a liability: structurally, the novel moves much like a song performed in one key, without a bridge or a chorus. 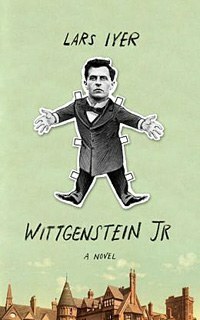 Wittgenstein Jr remains in a sort of structural stasis as Wittgenstein’s thoughts and life, as his motivations, unravel. Then the novel peaks near the end, where it tightens its focus but loses its passive narrator. This is both its strength and its weakness. When a character’s role in the narrative changes so dramatically, it feels as though the author has finally decided to wrap things up. As an ending, the device seems to violate the law of non-contradiction: it both works and it doesn’t work. Rather like philosophy itself, this novel’s success depends on what you, the reader, bring to it.